First of all we are talking of a disk partition, or a windows partition. Graphically it can be represented by a pie chart or band with sections which we will see in a bit. The computer data is held on hard disk drives. These hard disk drives can be written with raw information in many ways, but because of certain requirements, innovations and evolution the disk drives can support partitions. These partitions are like containers in which data is stored. The partitions can be as large as an entire disk or they can be smaller and then you can fit multiple partitions on the same disk drive. There are multiple partition formats but we are going to focus on the Windows partitions. Windows partitions are FAT, FAT 32 and NTSC. NTSC is the most advanced partition type and it allows for the most flexibility. So you always want to have your Windows Hard Drives partitioned with NTSC partitions. 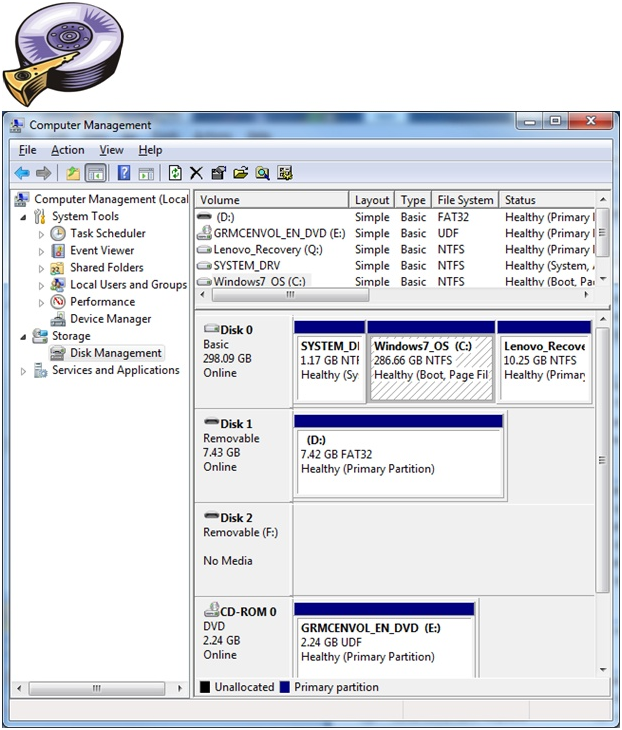 The image above represents the Disk Management tool in windows 7. If you look at Disk 0, there are three compartments, System_Drive, Windows7_OS and Lenovo_Recovery. These partitions reside on the same disk drive. Disk 0 is ONE physical hard drive. The Windows7_OS is the C: drive and it is visible within the Computer Window in Windows Explorer. However System_Drive is not visible to you when you browse your computer. Your computer usually comes partitioned like in the image above with windows 7 which contains the first two partitions and a third partition which is the recovery partition. The recovery partition is installed by the computer manufacturer. Windows comes with it’s own partition manager called Diskpart. It is a command line tool, and it is a bit difficult to understand to work with if you don’t have a manual of it. Diskpart comes with a help file which you can read, or you can ask for help and you will find how to work with it. You need to understand a few basic principles on how partitions work. The most important aspect of partitions is if they are active or inactive. Only one partition on a single physical disk can be active at one time, the rest are inactive. The active partition is connected with the computer boot process. Basically the BIOS is looking for the active partition, because the designated active partition contains the information about where the computer boot files and settings reside and those point towards your Windows operating system. It is very easy to get confused and change the active partition and render your computer inoperable. So when you are working with a partition manager pay attention which one is the active partition. Everyone might know the Power Button you just press it on and the computer boot process begins. BIOS POST – is a stage where the BIOS does the basic checking of all the existent Hardware and settings, then it looks for the MBR because the MBR tells the computer how the disk is partitioned and where to find the active partition. If you look at disk 0 in our image the MBR will be at the beginning of disk 0. Then it goes to the active partition and it loads the information contained on the active partition to load the Operating System. In our case would be Windows 7. If you install windows from scratch or over an existing installation, you need to understand how partitions work. Windows seven has a partition manager which is graphical and it can automatically partition the disk for you. However if you have a third partition or a recovery partition and you are just installing windows not recovering the computer, the extra recovery partition will be discarded. It is advisable to use your recovery DVDs or your Recovery partition or your System image. Search the Computer Manual to see how to create all the recovery options available. In windows 7 Disk management you can alter and create partitions but you are limited on what you can do. For that you need a third party disk management tool or partition management which will allow you to re-size and do more to the existent windows partitions. TIP: If you have multiple hard disks and you don’t know which one to boot from, then you have to change the BIOS Boot SEQUENCE. If you want to partition you computer you need a partition management tool. The Malwarebytes boot disc contains partition wizard with which you can see and alter your existing partitions. It is advisable to use this disc when your computer it’s not starting up properly either because Malware or partition issues. If your computer runs normal and you’re altering the partitions then you might render your computer inoperable. If you look at disk 1, the partition is FAT32 format. This is a USB key chain flash drive. You need also to know that FAT 32 partitions don’t support files larger than 4GB. Soif you like doing video editing, then you can’t have larger files than 4 GB. If you look further down the image there is a DVD ROM disc partition which is an UDF type.